Your cast iron tub is the focal point of your bathroom, if not your entire home. It’s timeless, luxurious and sophisticated. You and your guests might just be tempted to dip into it on a daily basis — until it gets dirty, that is. A cast iron tub can begin to appear stained, scratched or dirty for a number of reasons. Here’s how to the clean cast iron properly so you can extend the life of your unique bathtub and continue using it for years to come. Cast iron tubs are a coveted item in the world of home renovation and design. But when it comes to maintaining the cast iron tub through cleaning, it’s not actually cast iron that you’re dealing with. In fact, cast iron tubs are typically coated with a layer of enamel, explains Brittney Morgan at Apartment Therapy. This means that stains, scratches and other forms of wear and tear will actually need to be removed from the coating, not the cast iron itself. Keeping this in mind, you’ll have to determine which kind of stain you’re dealing with so that you can choose the proper cleaning agent. Stains that appear in shades of orange, red or brown are likely the cause of high iron deposits in water, says Deborah Stephenson at Hunker. 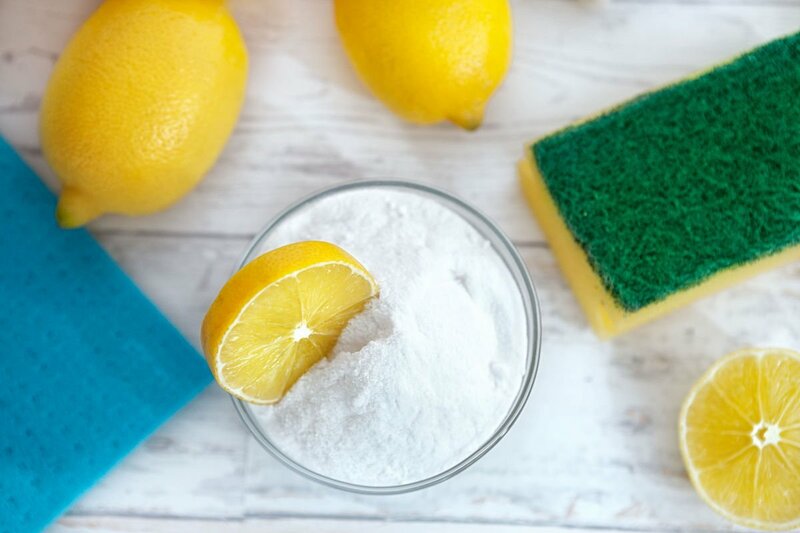 She adds that while these stains can be particularly hard to remove, lemon juice and salt can work wonders on removing iron from porcelain or enamel. Iron in clear water appears orange and reddish over time because it builds up and then rusts in the tub, explains the team at the Clean Water Store. Iron is particularly prevalent in well water: At levels higher than 0.3 parts per million, it can cause staining of fixtures and clothes. “After exposure to oxygen, or after the addition of oxidants (such as chlorine bleach or hydrogen peroxide), this ferrous iron will be oxidized (“rusted”) to the ferric form to form insoluble particles,” the team writes. Another sign that you have water with a high iron content is if you experience rust deposits or stains on freshly washed clothing, according to the Minnesota-based water softening company Water Doctors. A metallic flavor or smell in water coming from the tap is also a telltale clue that the water has high iron deposits. Remember, just 0.3 parts per million is enough iron to cause staining and temporary damage to your fixtures, so it’s important to identify your water’s iron content early on. If you begin to notice these effects but you aren’t sure what’s causing them, it might be worth getting your tap water tested so that you know how to clean your tub best. You might also be faced with green or blue stains in your bathroom. If you see these stains in the tub, sinks and toilet, it’s likely the result of copper piping. Copper pipes and fixtures leave deposits in your water that eventually undergo oxidation, which is what causes the discoloration, explains water treatment company Aquarius Home Services. Many people associate green stains with mold, which can lead to improper cleaning and care of the bathtub. While these stains are commonly mistaken for mold, they don’t pose any threat to your health. Plus, they’re easy to remove with the proper tools and products. The team at Aquarius suggests using vinegar, flour and salt to remove stubborn copper stains from your cast iron tub. “Create a paste by mixing together equal parts white vinegar, flour, and salt. Apply this paste to any copper stains in your bathroom. Allow it to sit for 30 minutes, then wash it away with some soap and water,” they write. Common household products can work wonders when it comes to cleaning a cast iron tub. Baking soda is a fundamental item when deep-cleaning your bathtub. The first step in using baking soda is to sprinkle the tub liberally with the product, according to licensed contractor, Brittany Bailey at the Pretty Handy Girl blog. Then, she says to scrub the surface with a sponge, which helps release the deposits and residue on the tub’s surface. Next, she suggests pouring vinegar into the tub and onto the sponge to loosen up the deposits. Apartment Therapy’s Ashley Poskin agrees that baking soda is a great way to clean the tub on a monthly or bi-monthly basis. She suggests using the baking soda with ammonia, however, which can cut through grease and remove soap scum buildup. Another natural cleaning solution comes from Kim and Scott Vargo of the popular DIY blog, Yellow Brick Home. The couple explains how a combination of baking soda, hydrogen peroxide, and lemon works wonders for their enamel cast iron sink. This same strategy can be applied to a cast iron bathtub. Using a non-abrasive scrub pad, they suggest sprinkling the surface with baking soda before following with a few drops of hydrogen peroxide. Then, the grime will wipe away with gentle, consistent circular motions around the drain. The lemon is a great addition because it acts as a natural bleach and can freshen up both the tub surface and the drain. Using a non-abrasive sponge to scrub the tub with natural methods, such as baking soda and ammonia, can remove tough stains without causing any damage to the tub. 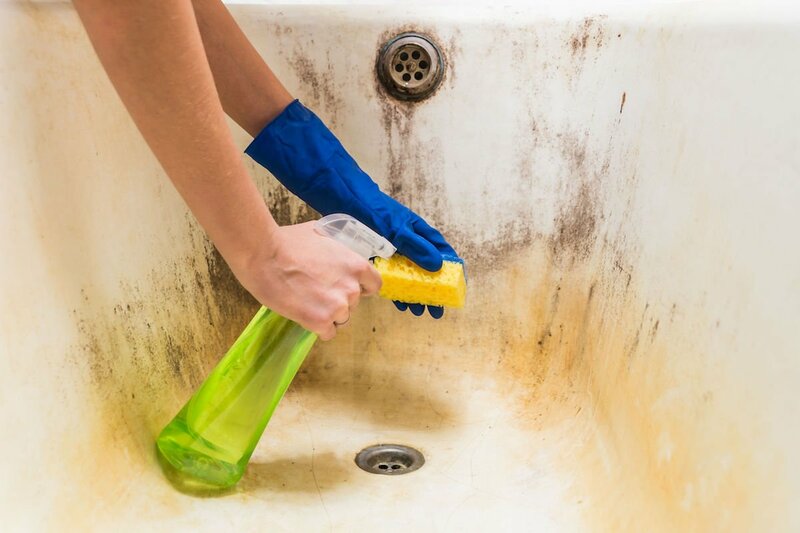 In fact, abrasive cleaners and scrubs should always be avoided when cleaning a porcelain enameled tub, explains Illinois-based company Ravinia Plumbing. “Do not use steel wool, wire brushes or abrasive sponge pads on any part of the item, as they can scratch or damage the surface,” they advise. For stains that are harder to remove, tougher cleaning options exist. For example, cleaners purchased from the store can also work well for cleaning tub stains. Cream cleansers are much better than powered agents because they won’t risk scratching your tub, says Ask a Clean Person podcast host Jolie Kerr. She stresses the importance of testing these cleansers in a small area of the tub first, to ensure they won’t have any negative reaction with the tub or cause scratching. One rule of thumb is to opt for a cleaner with a Ph of between three and eight, says Ask the Builder’s Tim Carter. The number indicates how acidic or alkaline that cleaner is, and getting one within the three to eight range can ensure it won’t cause additional tub damage. These cleaners should also be used sparingly over time, as overuse can contribute to unintended damage. A deep clean should be repeated every month in order to keep mineral deposits from building up in your tub and causing discoloration. Once you’ve removed stains and discoloration, you may still have lingering chips and scratches in the enamel. These can always be filled in and repaired with the right touch-up strategies. “Small chips and dings can be repaired with an inexpensive porcelain touch-up solution, available online and at home-improvement centers,” says home expert, author and HGTV personality Don Vandervort. He adds that it’s important to match the color of the paint exactly to the tub so that you’re not faced with an uneven surface tone once the paint dries. Before applying paint to the chip or scratch, however, it’s essential to remove any flaking or damaged paint from the area, says professional remodeling and improvement writer Lee Wallender at The Spruce. “If a great deal of paint needs to be removed, use a new straight razor blade with the blade held at nearly flat against the surface,” he explains. Then, the area should be cleaned to remove any microscopic bits. Finish the preparation process by sanding down the imperfections. He suggests using at least a 600-grit wet-dry sandpaper for this. This is because any flakes or existing chips can get trapped in the drying paint, which can look uneven and unsightly.